October 2018 – Angie and Tom Taralla have two project cars in the works! 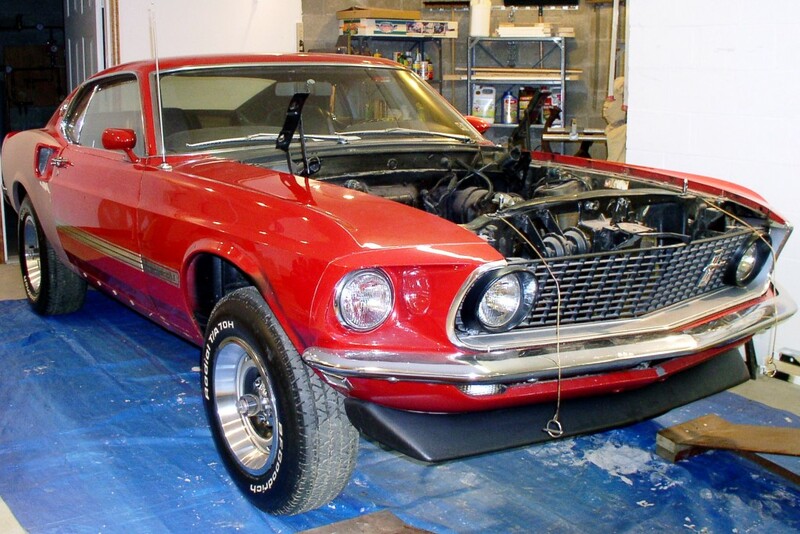 “Project Car” #1 is a 1969 Mach 1 with 428 Super Cobra Jet. It has the Trak Pak, it’s Candy Apple Red with red interior, automatic and used to be raced at Eldora Speedway in Fairmont WV. It’s been sitting in a garage waiting to be restored since 1978, it even has a ’78 inspection sticker on the windshield! It’s currently undergoing a complete rotisserie restoration as it is an all matching numbers, completely intact original. 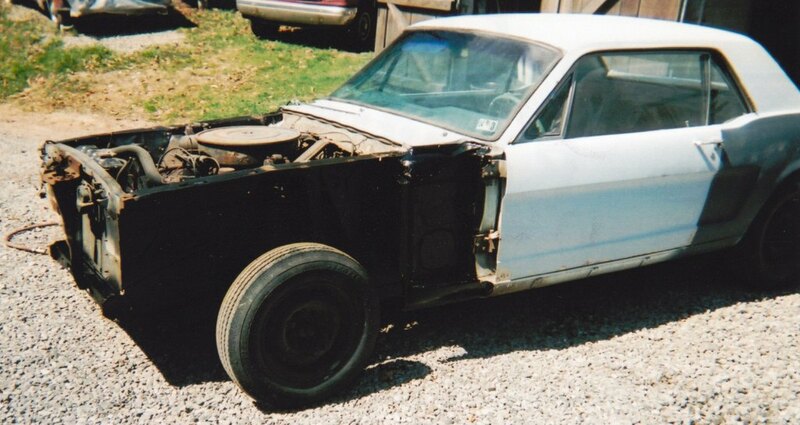 “Project Car” #2, our 1970 Mach 1. It has a 351 Cleveland but the engine has been built up to 407ci and the car is being modded out. It already has coil overs and 4 link suspension that we installed, now we are adding EFI, a roll cage, deleting the rear seat, changing to a 5 speed, digital gauges, LED lights, interior upgrades like new seats, new door skins, emblems, hydro dipped dash, trunk accessorized, etc. It will remain blue with black interior! 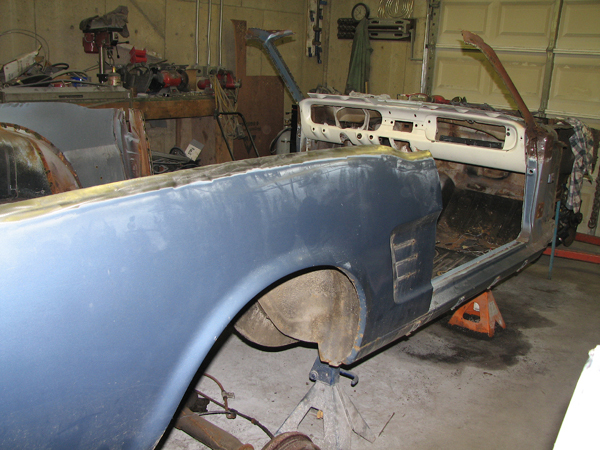 January 2017 – Dan rejoined the club and brought photos of his restoration project. 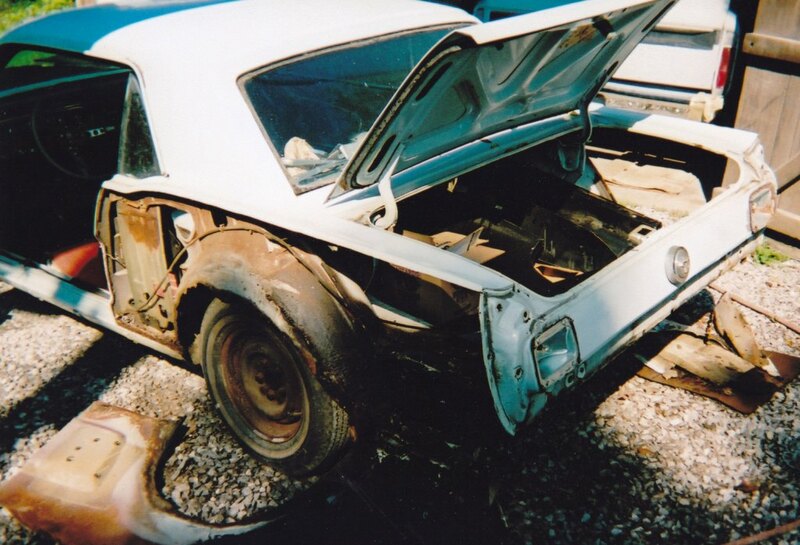 Here is his story “When I looked at a 1967 Mustang coupe off of Perrysville Ave, the engine was out, fenders and suspension were off of it. Parts were labeled in bags, new parts were in the basement of the house, etc. Somehow I thought I was the guy to save it. I knew next to NOTHING about Mustangs. I have learned a lot since then. July 2015 – Rich’s 5-year restoration of a 1978 Ford Mustang King Cobra resulted in the beauty shown below. 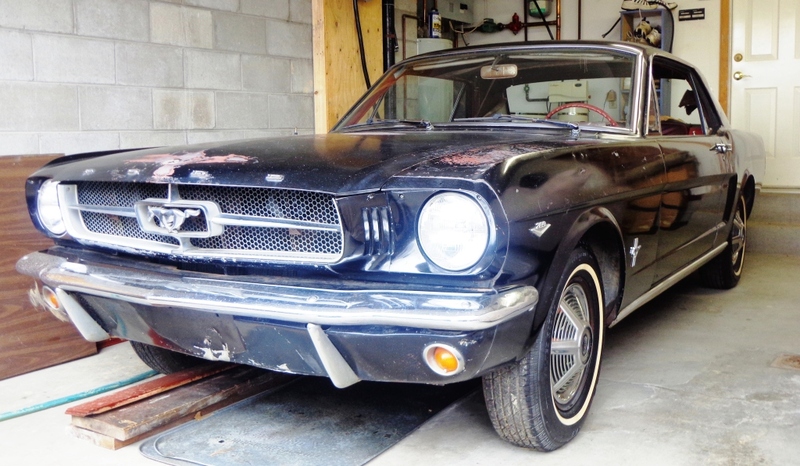 Says Richard, “After finding a T-Top FORD Mustang King Cobra in a sports car trader magazine in 1994, my son and I purchased the car which ran and looked good. 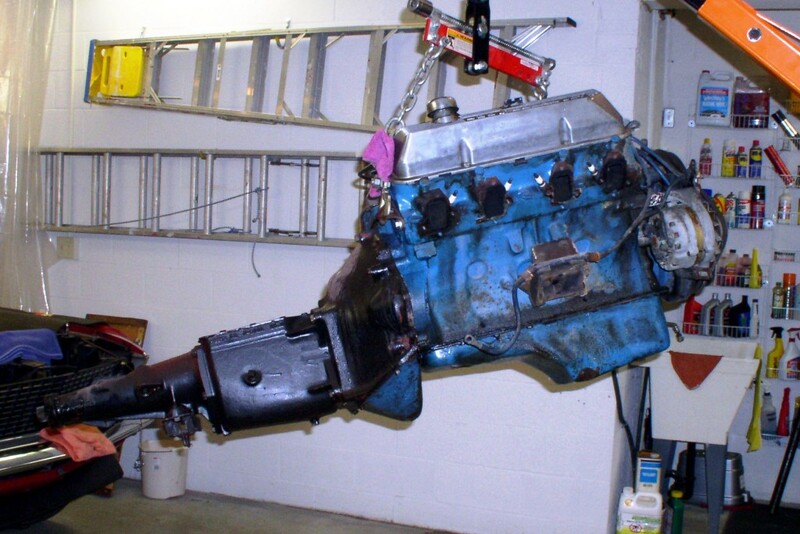 The car rebuild started in December 2009 with rebuilding the engine and transmission. All mechanical parts were also replaced. The interior was replaced in the winter of 2011. Body repair, painting and replacement of all decals and pin striping was finished in April 2015. 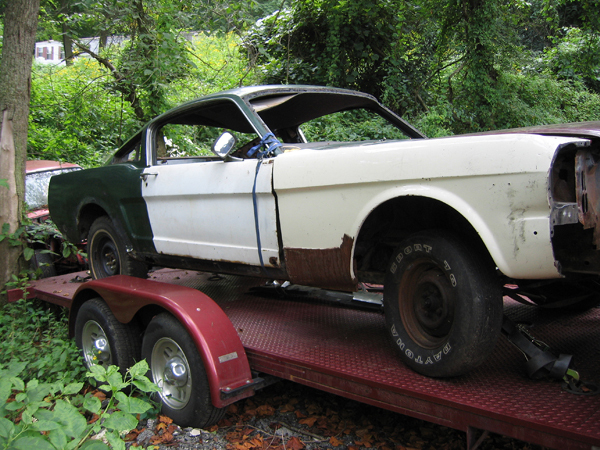 May 2013 – Gerri’s 1966 Mustang has been fully restored. Here’s a look back at the changes – all for the better! 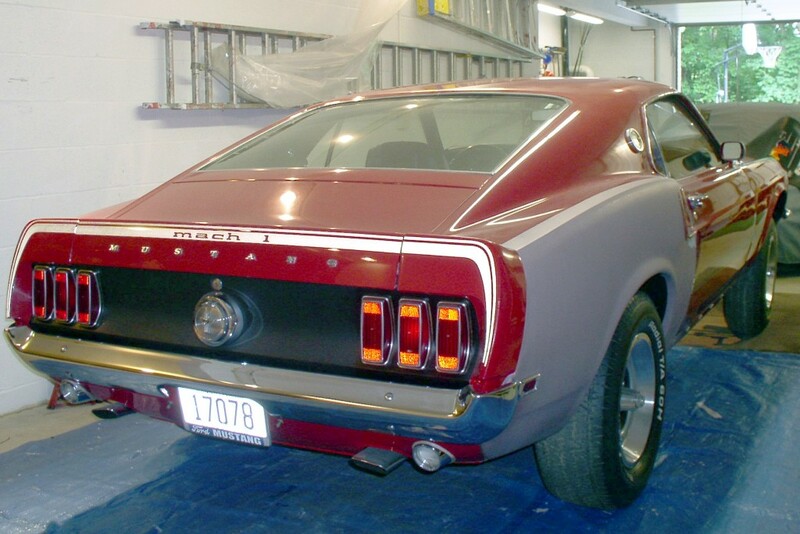 May 2013 – From Tom H: Here are recent pix of my 69. Bought new, now 51k miles, 428 SCJ, Drag Pac. Paint, except primer areas is original. Million small dents, replaced rear quarters and outer wheel houses due to rust out on returns. 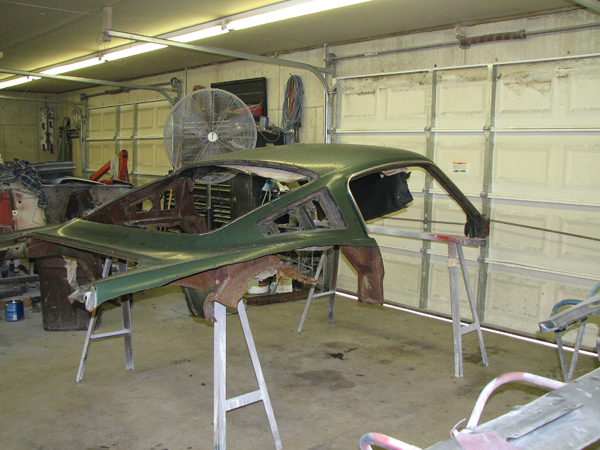 March 2013 – From Bob Q: Here are a few photos of my project. 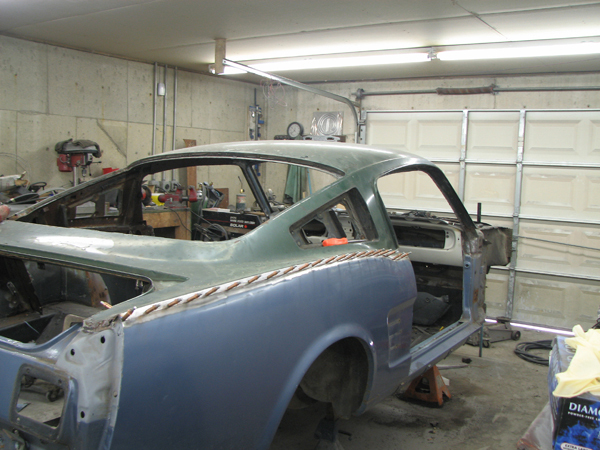 As you can see I converted two cars (a fastback and a coupe) into one. Hopefully the “new car” will be finished this year. It will probably be the only fastback titled as a coupe. 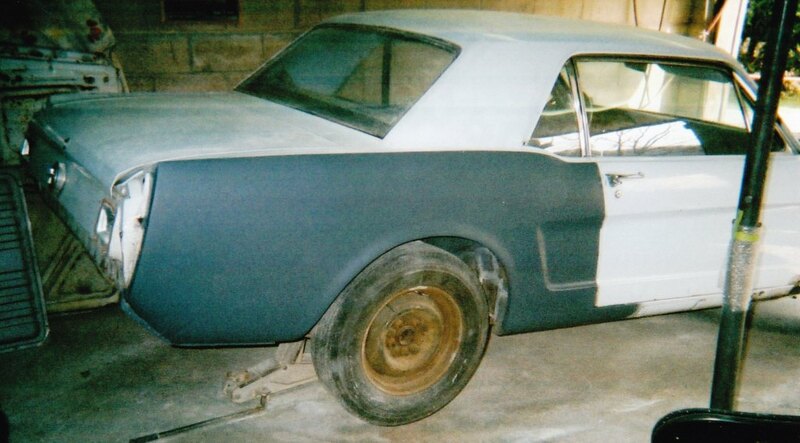 March 2013 – From Shaun & Tami: This is our 1965 Ford Mustang Coupe. 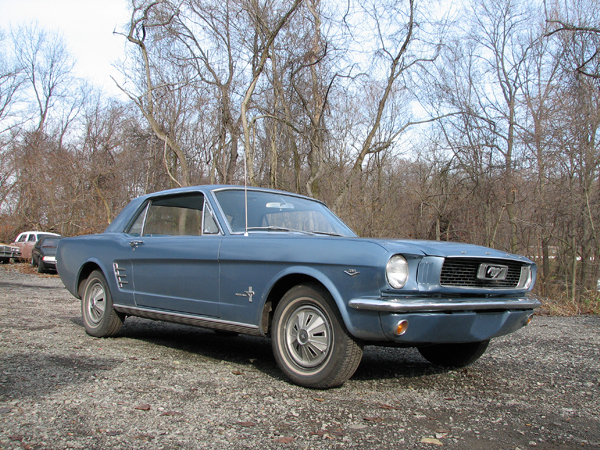 It was built on August 24, 1964 at Ford’s Dearborn MI plant and sold through the Pittsburgh District Sales office. The car has 52,324 original miles and is factory raven black with a basic red interior. It spent most of its life in Los Angles CA and that is were I purchased it last year. 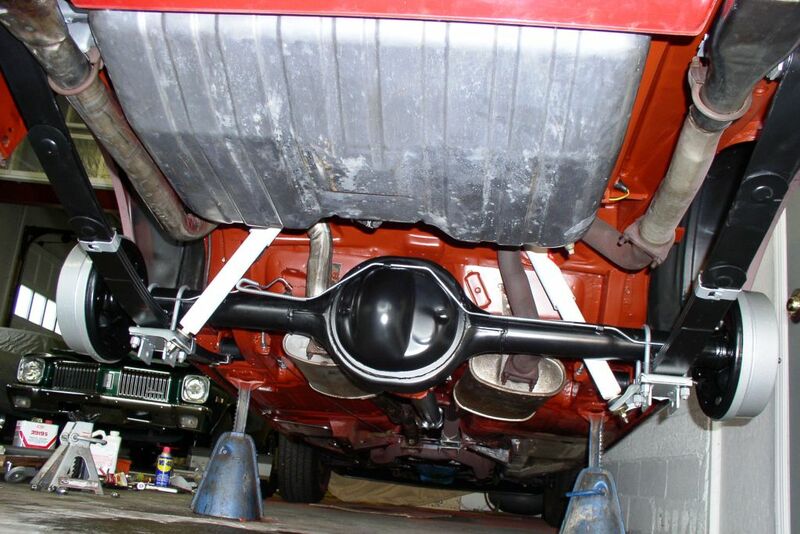 The car is a 289-2v with drum brakes, no power steering, no A/C, C-4 auto transmission. 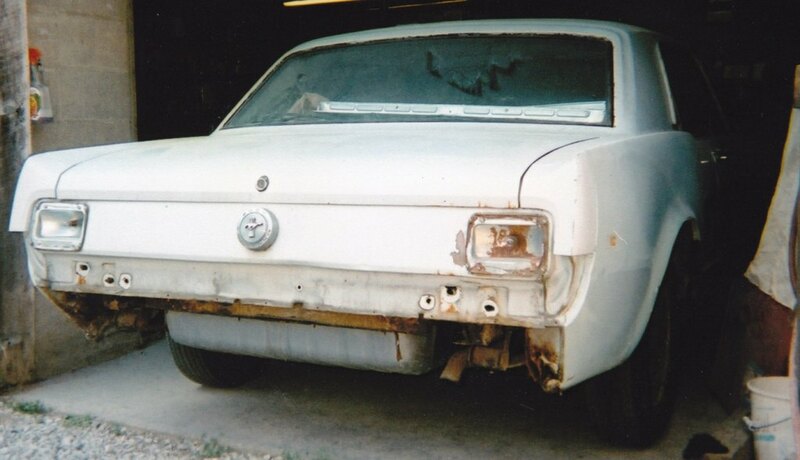 I plan to begin the project this summer to restore this car back to stock condition. May 2014 Update from Shaun & Tami – I have finally started on it and have attached two photos to prove it. 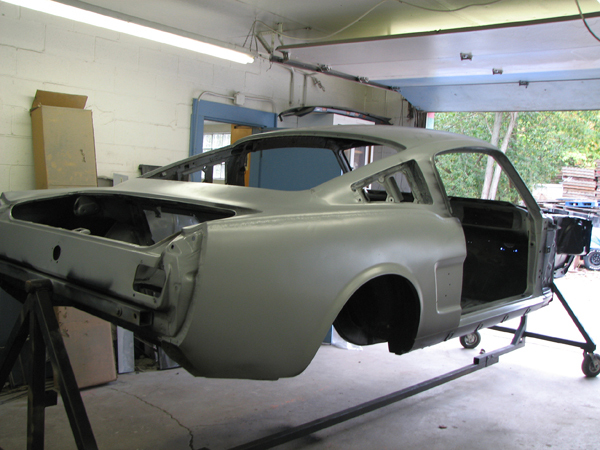 December 2016 Update: “Our 1965 Mustang coupe is now finished. It will be making its first appearance at the MCA show in Pensacola FL in March.” See the beautifully restored results in the Member Car Corral.